What Is a Car Insurance Grace Period? Many car insurance carriers offer a grace period. They are not all created equal and can vary a lot per insurance carrier. Grace periods can certainly come in handy, but it is important not to overuse them. Becoming dependent on your grace period can get you in a tight spot in the future. Learn what a grace period is and how to use it wisely. What Exactly Is a Grace Period? A grace period is the amount of time you have to make your insurance payment after your normal due date. Paying within an allotted grace period will allow your insurance policy to continue without a lapse in insurance coverage. How Long Is It Normally? Unfortunately, there is not a standard grace period offered by all insurance carriers. It varies by insurance policy and state. Some insurance policies come with grace periods of three days, while others offer up to 30 days. Some companies offer a short grace period with no late fee and an extended grace period which includes a late fee. Do All Insurance Carriers Offer One? Unfortunately, not all insurance carriers or policies offer grace periods. Some states, such as New York, do not offer grace periods. You will have better luck when you are insured by a preferred market insurance carrier versus a high-risk auto insurance policy. High-risk policies usually offer shorter grace periods and come with higher late fees. A grace period is an extra perk, not a requirement. Do not automatically assume you have a grace period with your car insurance policy. Can I Use It Every Month? Some insurance carriers do allow clients to use their grace period every single month. However, it is never a good idea to do so. Paying within your grace period every month can have some very negative consequences to your policy in the future. Late fees are often added to your payment when you pay in your grace period. Late fees can vary from two all the way up to 20 dollars. Adding that kind of fee to your car insurance premium can make a huge difference in your annual insurance cost. When you are late on your payment, it can disrupt your future payment plan. Only so many days are in a month, and the insurance company is required to send you a bill with so many days notice. Paying within your grace period every month can throw the system off leaving you with a double payment in a future month to catch you up. Preferred insurance carriers may be less likely to reinstate your car insurance policy if you pay during your grace period every month. If your policy does ever lapse, you want to show you were a good client who always paid promptly. Paying in your grace period over and over could reduce your chance of being reinstated. Beware of insurance carriers who allow payment in a grace period except for renewal payments and sometimes the last payment in a billing cycle. Abnormalities like this make an accidental lapse in coverage more likely. Know your insurance carrier's grace period rules and make sure to follow them. An accident can happen at any time, even during your grace period. Fortunately for you, claims are typically covered, however, many companies will not proceed with the claim until you are caught up on your payment. Plan on paying your late payment, your current month's payment, and your deductible if you have one for your claim. It is a lot of cash to come up with all at once. It is just one more reason why getting behind on your payments and using your grace period regularly is not a good idea. What Happens If I Go Past My Grace Period? At the end of a grace period, your car insurance coverage can be stopped by your insurer—in other words, you no longer have car insurance—and in every state but New Hampshire and Virginia, this means you are breaking the law. If an accident occurs even one day after your grace period, you are on your own, without any coverage from your prior policy. Many states also charge a daily fine if you are caught without car insurance. 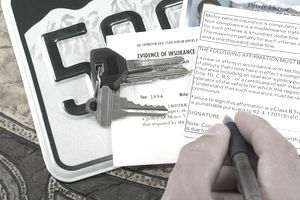 To get your insurance coverage back on your vehicle, there are often more penalties, which usually means a higher rate or a stricter payment plan option. You will probably have better luck working directly with your insurance agent than if you sheepishly send payment with no explanation. Ultimately, it is up to the individual insurance carrier whether or not to reinstate your policy. A grace period is there to help you in an emergency time of need, not as a de-facto new due date. If you do not like your payment date or it is inconvenient given the way your payday falls every month, ask your insurance agent to help you change your due date. If mailing in your payment is a hassle, look into paying online via direct deposit or credit card. Do not rely on your grace period every month; it will always cost more money in the end. What is the Penalty for Driving Without Insurance in New York? How Do I Find Out if I Have Car Insurance? Can I Get Temporary Car Insurance in California? How Much Car Insurance Is Required by the State of New Jersey?